Eastern Gray Squirrels can be black, gray or even white in colour. 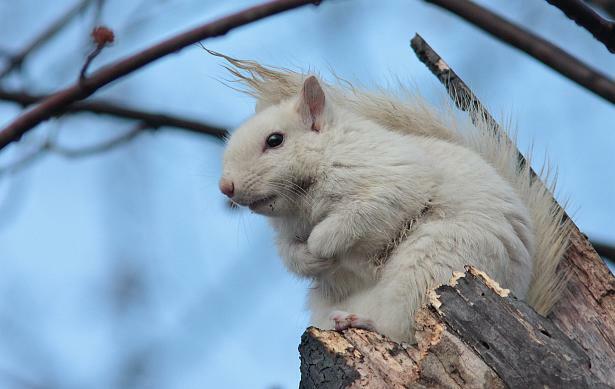 This white squirrel was photographed by Paul Pratt in Riverdale Park (corner of Riverdale and Little River in Windsor) on December 27. Saturday, Jan 12: Ojibway's birding trip to Point Pelee today had some unusual sightings including an adult Turkey Vulture and overwintering birds such as robins, Cedar Waxwings, Hermit Thrush and White-throated Sparrows. During our lunch in Woodslee there was a great opportunity to study goldfinches, Common Redpoll and 20 Pine Siskins at a feeder and we had a close look at a roosting Long-eared Owl. Wednesday, Jan 09: Ian Woodfield reported a flock of 18 Common Redpolls today on the tallest hill at Malden Park. An immature Red-shouldered Hawk was also seen today along Matchette Road near the entrance to the Ojibway Nature Centre. The recent mild weather (16C on the 7th and 15C on the 8th) melted all the ice and snow in the park. Three gartersnakes were seen at Ojibway on January 7th. Tuesday, Jan 01: The Detroit River Christmas Bird Count was held today. Fourteen birders helped with the Canadian side of the count circle. Click here for the results.